Our last full day in Iceland we kept the rental car one more day and mopped up our shopping errands. Christmas combined with pretty short store opening hours in general meant we hadn't really bought anything to take home yet. First we went to the mall. Our hope was to avoid the tourist prices that were probably lurking in the tiny little shops by our hotel. Unfortunately most of the mall was imported stuff that wasn't that interesting. The whole point was to buy Icelandic-looking stuff! 66° North is an Icelandic clothing company which had really cool billboards all over town. When we found their store at the mall, though, it was super expensive. One camo jacket that I thought looked cool was $550. Vínbúðin is the only place one can buy packaged alcohol in the country, and it is state owned. Their hours aren't very long, and there were probably 15-20 waiting for it to open at 11:00. Whether because of this Soviet arrangement or taxes, buying alcohol is ridiculous in Iceland. A 750ml bottle of Captain Morgan cost 5690 Icelandic Krona, or about $44.47. No thanks! This Duff Beer of Simpsons fame is the only little thing I bought. Apparently the reason this isn't available in the US is that it is unlicensed. It looks like the German company who makes this is getting the soul sued out of them currently. With our mall trip mostly a fail, we went back to the little shops of downtown Reykjavik. The typical Icelandic wool sweater pattern is displayed on the two white ones. They were pretty expensive as well. I asked a store clerk at one point where we could find less expensive clothes. I thought surely that locals wouldn't pay these sorts of prices for things. She said that personally she saves up and then goes clothes shopping in the US. God bless America. After shopping we stopped by one of the several public hot tub places in Reykjavik. 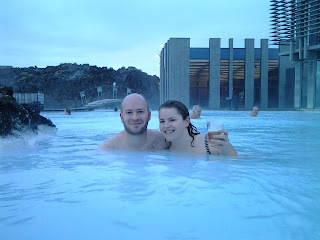 It was super cold and windy, so the walk to the hot tubs was uncomfortable, but once inside it was quite nice. They had a heated lap pool as well. There was a water slide but it was a far enough walk from the safety of the heated pools that we couldn't risk it. It was at this point Lydia started complaining that she hadn't eaten anything repulsive in a few hours. I did my best to fix that problem. Svið is a traditional dish consisting of a sheep's head singed to remove the hair, boiled, and then cut in half. At the BSÍ central bus station cafe, this plus two sides can be had for the low price of 1650 Krona, or about $12.78. What a deal. Its tongue was still in its mouth. We had some edible food for dinner later on. This was hashed fish with black bread. At the end of the day it was time to return our faithful rental car. It was Škoda branded. Kind of cool battle scene on the hotel lobby wall. The next morning it was time for us to depart. Our flight was pretty late in the day though, so our tour company took us to the Blue Lagoon first. On the drive we encountered a police car blocking the entire highway. We had to take some side road around the highway, and while driving our tour guide stated that the road was closed because a different bus from our same company had caught fire in the middle of the highway. No one was apparently hurt, and on the bright side he said that they would probably now be able to buy a new bus. Comforting. The Blue Lagoon is pretty much the biggest tourist trap in Iceland. It's an interesting place, plus it is near the airport which makes it a convenient stop. At the airport there was some more opportunities for Yule Lad activities. Turns out the airport is tax free even for Icelanders, which meant they were buying alcohol and other luxuries there like crazy. Which Yule Lad is your head poked in?